In Loving Memory of Sweetpea, one of the greatest loves of my life. Ground in memory of you. and together we'll pass through. And I whisper "I love you from here to Eternity"
I really enjoyed your comments. Yes, black cats are awesome. I am not very tech savvy, despite having 4 pc's and 6 monitors for trading. I have no i-products as yet and as you know do not know how to start a new thread here. I also am not sure how to post photos of my kitties but I am going to try to figure it out. Our Nebelung is just gorgeous - he is a still fairly rare breed - elegant, and the softest thing this side of heaven. The tuxie is of course adorable and you all should see Jake, the all black one - I call him "His Fuzziness". Note: There are several places on the site where you can start new discussions, show off your cats, get help, etc. Click here to post a question - Ed. Thanks for sharing the story of your vocal cat, Odile, enjoyed reading. Your kitty sounds very handsome! I love vocal cats and cats w/unusual meows and I love black cats. Little Bit had an unusual meow and a funny little noise he made like a meow w/o opening his mouth or even being awake. I had a fairy cat named DiannaFey. Her meow sounded like fairy bells tinkling, she could meow my name, she could say "oh no....no no..." She was solid black long hair. She passed at age 4. DiannaFey was on her way to once in a lifetime cat. She passed the same day as Little Bit 10 years ago. She saved me when Sweetpea died. Midnight saved me when DiannaFey died. Little Bit saved me when Midnight died. So, u can see why I have a thing for black cats. I've had 5 black cats, I have rotten luck w/them. They were all such great cats! I worry myself crazy over them b/c they have a tough time in shelters and such. Thank-you, Odile, for your kind words. I feel the pain you carry with Charlie's loss. Your friend reminds me much of myself, our stories mirror each other. I have lots of cat stories, lots of sorrow to write about. I hope I don't wear out my welcome on this site. This site is a wonderful source of comfort and the kindness from strangers here is a beautiful thing. 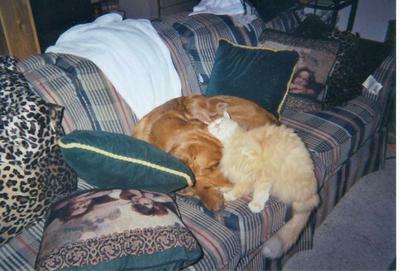 In the picture gallery, I posted a pic of SadieMae and Percy (still living). They are my slapstick comedy duo! I also posted a pic of Angel, her life story is unusual and her death is why no one is allowed out anymore. Our newest cat is all black with truly emerald eyes. He looks like a large Bombay. We are his first home in 6 years because people don't like black cats and he was very unhappy with his foster home. Other cats there attacked him and he was so stressed out there that he chewed off most of his tail fur. We were told he was very sensitive. Jake LOVES it here- has fallen in love with our tuxie female and they are inseparable. He even gets along well with our other male. He is not at all shy; he climbs up to the highest places and has investigated every area of the house. My question is about his wailing, or singing. The first few nights this happened I feared he was in pain, but he is just vocalizing. He does it all the time, mostly at night. If I imitate him we can have a "conversation" for a long time. These sounds are fairly high-pitched and sound like wails or howls. He also makes other sounds - when he licks the tuxedo or snuggles with her he may chirp or cluck. I am just wondering if anyone has had this experience with cats and what it may mean. On occasion I have given him treats or played with him when he did this and the wailing stopped for an interval, but then resumes. Yes, I recognized your name from your post about Little Bit - that is why I said "so much pain". Charlie has been gone since Oct. of 2013 and his passing has left a huge hole in our hearts. We both miss him all the time. Not a day goes by that he's not in our thoughts. The pain is less acute than when it first happened but it is always there nevertheless - I realize it will always be so and I will miss him forever. A friend lost what she called her Once in a Lifetime Cat. He was black and white and she subsequently rescued no less than 13 others - all with the same coloring. She chose to take in special needs cats and spent a fortune in time and money caring for them. They gave her much joy although sadly she has now lost 6 of them; many were quite old when she took them in but she gave them wonderful lives in the time they had left. She still yearns for the original but at least some good came of it; she has helped many others. The same is true of you. All we can do is be grateful for the time we had with them. I look at my 3 kitties every day, all of which are healthy, and remind myself constantly that they are only on loan to me, and that I should cherish them while I have them. She has been gone from me a long time now, yet not a day goes by that I don't shed a tear. I miss her like crazy. Sweetpea was very special. In fact, it was my broken heart, an attempt to fill her shoes..err, paws, that led me to acquire 13 other cats. I say acquire b/c I never really sought out cats, they all found me just when I needed them most. They're all gone now too, except for 3. It's been a rough 2 years for sure. I know exactly how you feel. I lost my sweet cat Puffy 2 years ago. So sorry for your loss - I know how you feel as my darling kitty Oreo went to Kitty Heaven several months ago and I miss waking up to his licking my on my nose and cheek and cuddling with him. We will all meet in kitty heaven. I am deeply sorry - so much pain! I am going now to hug my 3 and need to bury my face in their fur. Nothing else will make me feel better. ...but what a sweet looking pair. Friends furever indeed.